Boasting a spectacular setting on the golden Jandia beachfront, on the southeastern tip of Fuerteventura, is 4-star Hotel Iberostar Playa Gaviotas. A popular choice for couples and families alike, this all inclusive property combines peaceful surroundings and swaying palms with splash-tastic swimming pools and superb leisure activities in the sunny Canaries. 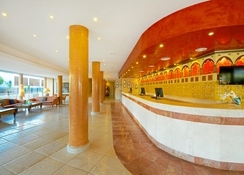 Iberostar Playa Gaviotas Park Hotel has 206 rooms and suites across 6 floors, divided into Junior, Regular and Senior suites – fit for the comfort and variety of guests. During the day, swim in the pool, head to the spa for a pamper session, or get active at the fitness centre, plus volleyball, aerobics and other leisure activities. If you’ve got the kids in tow, the entertainment team will organise fun-loving activities and games to keep little ones occupied. The hotel boasts two restaurants, a lounge bar and an entertainment bar to ensure guests are satisfied morning and night. 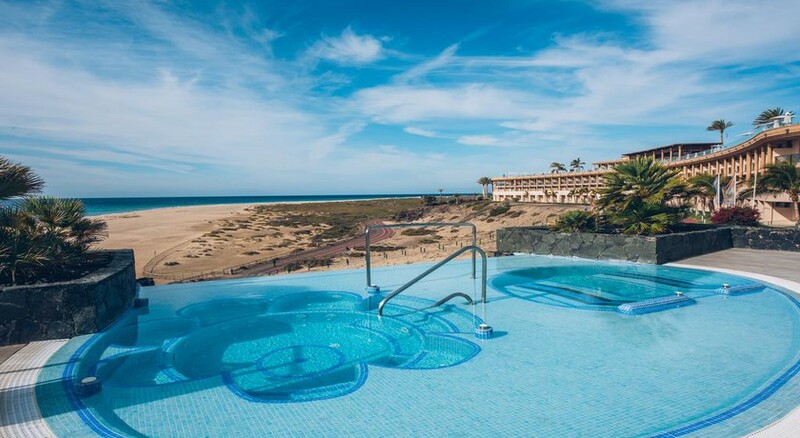 Located in southeast Fuerteventura, fringing the gorgeous golden beach, Iberostar Playa Gaviotas is ideally situated for couples and families wanting a relaxing stay in the Canaries. Catch a local bus to the nearby fishing village of Morro Jable (about 2km) to experience a taste of the local Canarian culture, or leisurely wander down Jandia beach soaking up the sights. The property is 5km from Fuerteventura Port of Rosario International Airport. Guest accommodation at Hotel Iberostar Playa Gaviotas oozes Mediterranean-style decor with bright pastel interiors, traditional fabrics and smart furnishings set on cool tiled flooring. Divided into 134 Suites, 56 Junior Suites and 16 Senior Suites, the room types and facilities cater to every type of guest. Each room has a private furnished balcony, air-conditioning, en suite bathroom, satellite TV, telephone, mini fridge and safe box for hire. There are adapted rooms available to guests with disabilities. Hotel Iberostar Playa Gaviotas’s Bentacuria Restaurant offers buffet-style breakfast and dinner of international cuisines and show cooking. Del Castillo Pool Bar offers late continental breakfast, lunches of pizzas, pasta, vegetables, salads and desserts and bar service, and the Lobby Bar with a terrace serves sandwiches and beverages. The Tindaya Bar offers a mini disco for youngsters (8.30pm-9.00pm) followed by shows hosted by the entertainment team, while the Bowling Bar serves drinks and offers bowling, snooker and table football. Evening entertainment is provided from 8.30pm to midnight includes live music, disco and entertainment shows. 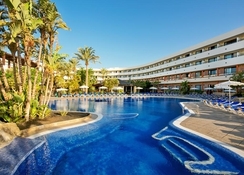 Hotel Iberostar Playa Gaviotas has a swimming pool, sun terrace and gardens with loungers and parasols. The spa includes a fitness room, thermal pool, Turkish bath, sauna, massage room and indoor Jacuzzi and offers a range of beauty, therapy and massage treatments influenced by the Far East. It also hosts a comprehensive Fit & Fun sports programme to have fun while also keeping in shape on holiday. On-site activities include a rifle range or archery, snooker, basketball, darts, table tennis, tennis (lessons available), and dance classes. Guests will also have direct beach access with bundles of exciting watersports activities, including diving and catamaran sailing, cycling and hiking trails and nearby golf course. There is also a Children's pool and play area, games room with hosted activities, Mini Club (4-7 years), Maxi Club (8-12 years), Teenie Club (13-17 years), children's menu and evening child care service (charge).